Meet The Team | Wadsworth, OH | Family Dentistry on the Square, Inc.
Carol has been with our practice in many capacities since 1993. She completed her dental assisting program at Medina County Career Center and was an assistant here for several years before taking on the challenge of the front office. She has been working with insurance and billing for several years now. Carol lives in Medina with Victor and teenaged daughter Meghan. Carol’s family loves their Great Dane “babies”! Nash is the 3rd and Luna the 4th they’ve had in their family. Marcia has been with our office since July 2013. Her 20 plus years of customer service in banking and inside sales makes her a great asset to our office team. While she is originally from Medina, she has lived in Wadsworth the past 20 years. Marcia enjoys sports, shopping and spending time with her son Kyle in her free time. 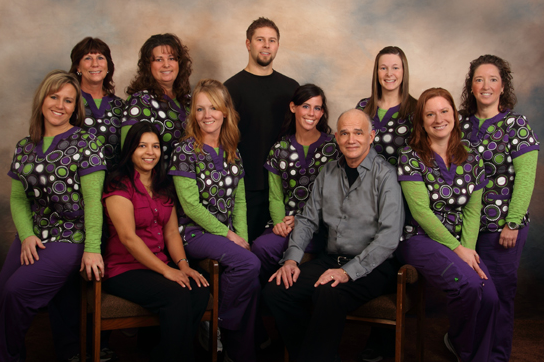 Dana has been a dental assistant for 14 years and a part of our staff since 2002. She currently works with our orthodontic patients. Dana and her husband Gary live in Sterling with their son Joey and daughter Emelia. She enjoys building their house and business with her husband. As a certified dental assistant, Joyce has been a member of our team since 2008 and part of our practice as a patient for many years prior to that. She completed the assisting program at Medina County Career Center. When not at the office, Joyce enjoys spending time with her family, especially her granddaughter and grandson. She also enjoys boating and fishing on Lake Erie. Kayla joined our team June 2018 as Dr. Kyle's assistant. She graduated with her associates degree from Stark State Technical College and plans to return in the fall of 2019 in the Expanded Functions Dental Assistant program. Kayla and her significant other, Casey, have quite the animal menagerie at home, including 2 Bengal cats, a Great Dane, poison dart frogs and multiple fish tanks. She looks forward to meeting and working with our patients. Ashley graduated from Stark State College in 2006 with her associate’s degree in dental hygiene. She has been a part of our team since 2008. Ashley and her husband Matt have three daughters, Kendall, Riley, and Haiden. When not in the office, Ashley enjoys shopping and spending her time with family and friends. Amanda is the most recent member added to our team. She would like to thank you for entrusting her in caring for you and your family’s oral hygiene needs. She grew up in the Massillon area where she attended Washington High School. She then went on to obtain an Associate Degree of Applied Science in Dental Hygiene from Stark State Technical College in North Canton. Amanda and her husband Aaron have a son, Austin, who currently attends the Cleveland Institute of Art studying game design. Austin excels in art and plays several instruments. They enjoy spending time together by watching sports and cooking. Crystal has been with our practice since 1986. During that time she has been a hygienist, worked with orthodontic patients and most recently has taken on administrative duties. As we are always striving to improve our patient care, she is working to keep our team efficient and organized. In recent years, Crystal has become a fitness enthusiast and began running in 2012. To date she has completed 6 half marathons and has plans to run more this year. She is an active member of Medina County Road Runners and is on the organizing committee for the new event MCRR Rise and Shine 10k. Like any runner, she loves to talk about running, so be careful what you ask her! !